This article attempts to provide a bit of background information. This may help you to get more out of your kit brew and to improve the quality of your beer even further. If you have any questions on brewing or any related subject, please do not hesitate to contact us. Brewing is based upon the fermentation of sugars into CO2 and alcohol by the yeast, which is a complicated biochemical and enzymatic process. Without going into the chemistry of sugars (which is complex) suffice it to say that not all sugars are equal. For example: table sugar, the various sugars extracted from malted barley, corn sugar and fruit sugars are all chemically different. The important thing to keep in mind is that some sugars ferment well, while others are less suited for the fermentation of beer. A good example is standard table sugar. Beer yeast does not "digest" this type of sugar very well. This results in a cidery, "green apple" off-flavour which is undesirable in most beer styles. Therefore this type of sugar should not be used for brewing beer from beer kits, even though the instructions on some beer kits simply tell you to add "sugar" to the wort. Corn sugar (dextrose) works better, as the yeast does not produce any off-flavours when fermenting this sugar. However, corn sugar does not produce any flavour at all; it is converted into alcohol and nothing else, contributing nothing to the beer's colour, body, flavour or mouth feel. Unfermented beer (known as "wort") should always contain a mixture of fermentable and unfermentable sugars. If there were only fermentable sugars (which disappear entirely during fermentation and leave nothing but alcohol) the end product would not be beer but merely sparkling, alcoholic dishwater. The unfermentable sugars which stay behind in the beer after fermentation is complete provide flavour, colour and other essential properties. For example, some beer recipes call for treacle sugar, molasses or lactose to be added to the wort before fermentation. The use of a brew blend instead of just sugar to supplement your beer kit is highly recommended. This will not only provide the right mixture of fermentable and unfermentable sugars, and also adds malt and hops to greatly improve the body and "mouth feel" of your beer. If you must use normal table sugar, or if you would like to add some of it to your brew to simply raise the gravity of the wort and the resulting alcohol percentage of your beer, the best solution is to convert the table sugar into invert sugar syrup. 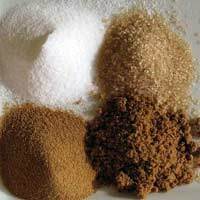 Table sugar consists of sucrose, which is not ideal for fermentation. Converting it into invert sugar syrup breaks up the sucrose into glucose and fructose, both of which ferment well and do not produce any unwanted off-flavours. How much sugar to add to your brew is a matter of taste and experimentation. Anything up to 500 grams (about two cups) of inverted table sugar generally works well to give your beer a bit of extra alcohol. Too much will tend to unbalance the beer. Keep in mind that more alcohol should be balanced with body, flavour and mouth feel, which is why a Belgian strong ale can easily weigh in at 10% ABV (Alcohol By Volume) or more, but a lager with the same alcohol percentage would be unpalatable. Making invert sugar is simple. Put one or two cups of white table sugar into a pot, and add an equal volume of water. Also add a knife tip of dry citric acid, which can be found in the baking section of your local supermarket. If you want to dose it more precisely, add one gram of dry citric acid for each kilogram of sugar. The citric acid acts as a catalist. A few teaspoons of lemon juice can also be used. Bring the mixture slowly to the boil, stirring constantly, and then let it simmer very gently for 30 minutes. Do not overheat as this will darken the sugar (the syrup will turn brown) resulting in a less fermentable product. Caution: the syrup will be very hot and will retain heat for a long time, and it can easily cause burns! Taste the syrup very carefully. The invert sugar syrup is done when it tastes sweet without any residual trace of acidity. Let the syrup cool down before adding it to your fermenter. Some beer kits tend to be a little bit on the "thin" side: while the beer tastes fine, it lacks the body and alcohol that are essential in some beer styles. A Belgian ale, for example, should be very full bodied and contain at least 6-7% of alcohol (usually more) but most beer kits fall a bit short of that mark. A good way to overcome this is to add a tin of unhopped liquid malt extract (light, amber or dark, depending on the beer style) to the beer kit. This will raise the original gravity and give the beer a fuller body. Adding a second beer kit to the brew is not advisable, since that would introduce too much hops into the beer and result in an overly bitter, unbalanced beer. You simply want to "double up" on the malt while retaining the original style and character from the beer kit. Yeast is a micro-organism that performs the vital role of converting the fermentable sugars in the wort into alcohol and carbon dioxide, thereby changing wort into beer. But not all yeasts are the same. Different yeast strains produce different flavours (because of the complex biochemistry involved with fermentation) and not all yeasts can produce the same levels of alcohol. Baker's yeast is totally unsuited for brewing, as it has virtually no tolerance to alcohol. In other words, as soon as a little bit of alcohol is produced, fermentation stops. In addition to that, it will not produce the right flavour. 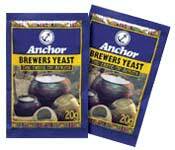 The packets of yeast intended for brewing traditional beers that can be found in any South African supermarket won't work very well either. These yeast strains will produce sufficient levels of alchol, but the resulting beer won't taste very good. These yeasts have been cultivated for the brewing of traditional African beers and that is what they should be used for. The packet of yeast provided with a beer kit is a universal dry brewers yeast which will work well with the beer kit that it comes with, and which fits the style of the beer being brewed. This yeast is easy to use, can be added to the brew without having to be rehydrated first, and will work well over a wide temperature range (typically 20-30°C). It has a long shelf life and can be stored under a variety of conditions. These advantages come at a small price, though: the flavour profile produced by this yeast tends to be relatively neutral. One easy way to improve the flavour of your kit beer is to replace the standard yeast with a more specialized one. Various dried yeasts are available. These yeasts should be hydrated prior to use (see the data sheet available with each yeast on our website for instructions) and the beer should be kept at the proper temperature for each yeast during fermentation. If the temperature is too low, the yeast will become inactive and fermentation will proceed very slowly or stop altogether. If the temperature is too high, the yeast will start to produce all sorts of by-products which can result in off-flavours. If the yeast is exposed to even higher temperatures (e.g. when you hydrate it using hot rather than luke-warm water) the yeast will die. Keep in mind that yeast is a living micro-organism, so age and adverse conditions can kill it. That is why packets of dried yeast should not be exposed to extreme temperatures and ideally should be kept in the fridge. The use-by date printed on the yeast's packaging is generally based on storage at room temperature. Refrigerating your yeast will help to retain its quality and shelf life. Unopened packets of dried yeast can also be frozen for an extended period of time, well past its standard (room temperature) shelf life. However, keep in mind that yeast does not like to be exposed to temperature shocks, so take the yeast out of the fridge or freezer several hours before use, and let it come to room temperature slowly before opening the packet. Liquid yeast can only be frozen after undergoing a special treatment to prevent ice crystals from rupturing the cell walls. This procedure is beyond the scope of this article. While a specific yeast does represent an additional expense (which increases the cost of brewing your beer) you do not need to buy fresh yeast for each brew. After bottling your beer, the yeast sediment left in the fermenter contains more than enough live yeast (and then some) for your next brew. Take a suitable container (any glass jar with a metal screw-on lid will do, such as a jam or pickle jar) and wash it thoroughly and then sterilize it. A good way to do this is to fill the glass jar to about 1/3 with water, place the metal lid loosely on top (but DO NOT screw it on or the jar will explode!) and place it in a microwave oven. Boil the water for a few minutes, allowing the heat of the water and the resulting steam to sterilize the jar. Let it cool and pour out the water. With a sterilized spoon or ladle, scrape the top layer from the yeast cake at the bottom of your fermenter and put it into the jar. The top layer of the yeast cake is mostly live yeast cells, while the bottom is mostly dead yeast cells and solids from the wort. Do not fill the jar to more than 1/3. Close the jar and put it in the fridge. The yeast will keep for at least 3 months. When you brew your next batch of beer, take the jar out of the fridge several hours before use and let it come up to room temperature slowly. Carefully open the jar (the yeast might have continued to build up CO2 pressure during storage) and pitch the contents into your fermenter. The live yeast cells will consume the dead ones during their normal initial growth phase, and fermentation will commence as usual. Note: this method makes sense for the more expensive yeasts. It is not really worth your while when you use regular beer kit yeast (which is supplied with each fresh beer kit anyway). Simply put, yeasts work in three stages. The first one is aerobic, meaning that the yeast works in the presence of oxygen. The second and third stages are anaerobic, i.e. they take place without oxygen being present. When you pitch the yeast, the wort in your fermenter should contain a certain amount of oxygen. Some brewers deliberately aerate their wort using pressurized oxygen. 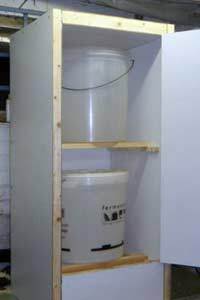 For the home brewer a much simpler method is more than sufficient: when you add wort or cold water to your fermenter, just splash it in from some height. This agitates the water sufficiently so that some oxygen dissolves in it. That will be enough. Then the yeast starts its first cycle of activity: it consumes oxygen and the nutrients present in the wort, and uses this to grow and multiply. The amount of yeast increases to a level far beyond the few grams of dried yeast that you added to the fermenter. Little or no CO2 and alcohol are produced during this stage. However the yeast does produce many flavour components during this stage. When the yeast has used up all the oxygen in the wort, the first cycle of activity ends and the second one begins. This is the primary fermentation stage, during which the yeast converts the fermentable sugars in the wort into alcohol and carbon dioxide gas (CO2). It is important that this cycle starts relatively soon, since the high sugar levels, oxygen and the absence of alcohol in the wort provide a fertile breeding ground for bacteria and other unwanted organisms. The activity during this cycle of primary fermentation will taper off as sugar levels drop and alcohol levels rise. (Alcohol tends to inactivate the yeast, which is why you need a special brewer's yeast that has sufficient alcohol tolerance rather than, say, bakers yeast which doesn't have any at all.) Eventually the production of CO2 stops entirely, which indicates that the fermentable sugars have practically all been converted and that the second stage of yeast activity (i.e. the primary fermentation) is nearing completion. The brewer generally takes gravity readings at this time to confirm that the specific gravity of the beer remains constant, in order to conform that no significant fermentation of sugars takes place anymore. Then it is time for the third cycle of yeast activity: secondary fermentation. For this stage, the beer is either transferred to a second fermenter or it is bottled. If the beer is transferred to a secondary fermenter, the brewer makes sure that most (preferably all) of the yeast sediment stays behind in the primary fermenter and only the live yeast cells still in suspension end up in the secondary fermenter. If the beer is bottled then priming sugar is added to the bottle, which will ferment inside the bottle and produce more CO2. Because the bottle is closed, the CO2 can't escape. It builds up pressure and stays in solution, thereby making the beer fizzy (a process known as carbonation). At the start of this process the yeast also consumes the oxygen that was introduced into the beer during bottling and the oxygen in the head space under the cap of the bottle. This prevents the beer from oxydizing, thereby preserving the beer and giving it a shelf life of at least a year or, depending on the beer style, much more. During this third cycle of yeast activity (which may take weeks or months) the beer matures. Yeast is a living organism and, having run out of sugars during the primary fermentation it still tries to survive. Therefore, as a survival strategy, it now starts to consume (i.e. break down) the numerous by-products of the primary fermentation. Yeast works according to complicated biochemical processes, and to say that it simply converts sugar into ethanol alcohol and carbon dioxide is an oversimplification. As a by-product of the primary fermentation it also produces numerous complex chemicals such as ketones, aldehydes, acetates and many others. Some of these byproducts improve the taste of the beer, while others don't. During the second fermentation or maturation stage, the yeasts convert many of the unwanted byproducts into more beneficial ones. That is why a naturally brewed beer matures so well over time. Incidentally, that is also why many mass-produced commercial brews not only taste so much less refined, but also take a much heavier toll on the body (think of the typical morning-after symptoms) when enjoyed in greater quantities: the harmful byproducts of the primary fermentation that are still present in the beer are in no small measure responsible for the nice, thumpy headache the next morning. Of course alcohol, vitiamin-B deficiency and dehydration play a role, but the chemical byproducts from the primary fermentation are a significant factor as well. That is why craft beers are so much healthier, and easier on the body. While your typical kit beer is fully ready to drink after four weeks of maturation, it continues to mature. Save a few bottles from each batch (stored correctly, at room temperature in a dark cupboard) and taste the contents after a year or more. The result is likely to surprise you!